Here's a journal page I did yesterday. The journal itself is an address book that I picked up at the op shop awhile ago. It's a fairly modern book but with an oldy worldy look about it with quite nice script in it. I'm not usually a 'heart' person, but listening to the radio the other day I heard a line from a poem that struck a cord. It was written by a guy named Barry Dickens after suffering with terrible depression. He'd had such positive feedback from many listeners that he wrote a poem expressing his gratitude. I don't normally drive around in my car listening to poetry either, but I just happened to catch this particular programme and thankfully I've never suffered with depression. 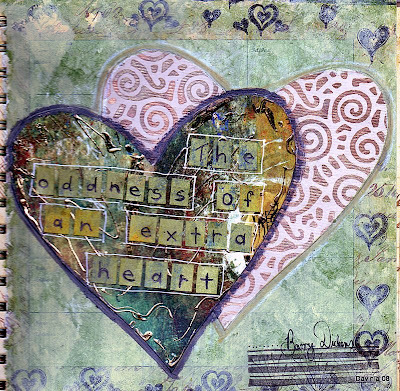 The quote is "the oddness of an extra heart". I used a couple of different shades of acrylic green, smooshed and blobbed on, then blobbed and smooshed and wiped off yellow for the backbground. Some heart stamps around the edge and cut two hearts from different papers. The heart with the words has drizzles of glue with gold Fab Foil over the top. Edged the hearts with watercolour crayons.